I always enjoy a challenge. Especially when it involves popping candy. 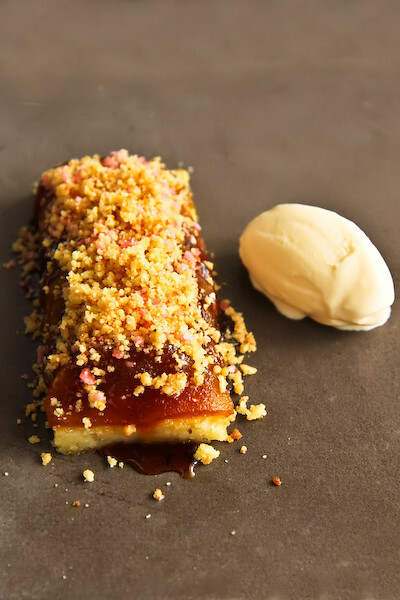 As soon as I saw Helen's review of Tomislav, the apple crumble dessert with macadamia sponge and clotted cream ice cream immediately caught my eye. I have a special place in my heart for crumbles. And this was a crumble with popping candy! 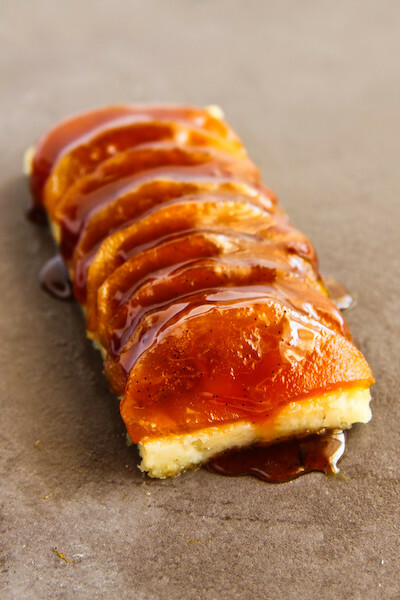 Unfortunately I've been too busy/poor/sick to eat out much recently, but when George from Wasamedia offered to share the recipe for this amazing dessert so that I try and recreate it at home, I couldn't say no. I love love love the idea of mixing popping candy into an apple crumble. There's always such a sense of whimsy when popping candy is involved. 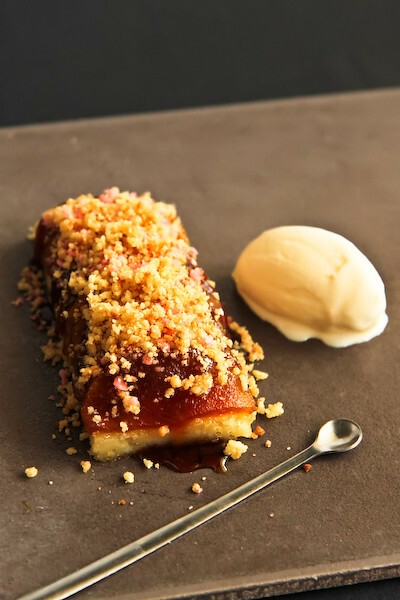 A fun twist on a traditional dessert like this is just what you would expect from chef Tomislav Martinovic, whose impressive experience includes previously working with Heston Blumenthal. The apple crumble dessert served at the restaurant keeps the popping candy well hidden within the crumble, but unfortunately for me the only popping candy I could get my hands was the strawberry flavoured kind, which was bright pink and a little hard to conceal. The recipe I was given provided some interesting hurdles to overcome, since the instructions included the use of a Thermomix and a Pacojet. Errr...yeah unfortunately I don't have either of those stashed away in my kitchen cupboards (I swear I would kill for either of them). And I was allergic to the macadamia sponge. So a fair bit of improvisation was involved, and I can pretty much guarantee my homemade version was nowhere near as good as the real one would be. But it was worth a shot! I have to admit I was a little lazy. I don't have an ice cream maker, nor did I have the energy to make it, so the ice cream in my photos is just some plain store-bought French vanilla ice cream. But I will include the recipe for the ice cream in case you feel like attempting it. I replaced the macadamias in the sponge cake recipe with pine nuts, and processed them with my food processor to get a fine meal. The sponge went pretty flat thanks to my stupid temperamental oven (same reason I had so many dramas when I was making madeleines recently), but it still tasted really delicious. 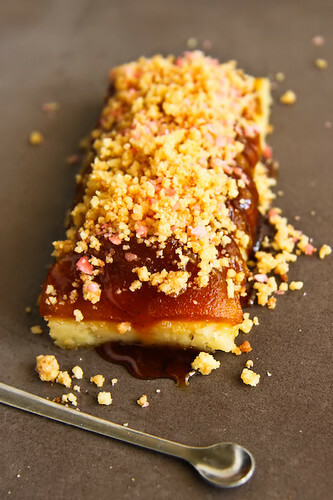 My favourite part is definitely the crumble mixture with the popping candy, it's so buttery, crunchy and crackling! 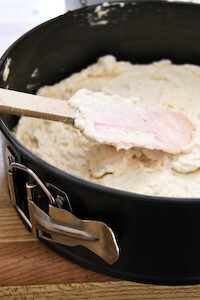 I was happy to eat the leftover curmble mixture just with some vanilla ice cream, it was so good! Combine milk, sugar cream and milk powder and bring to the boil. Let to infuse for 30 minutes. Add to the yolks and pass through a chinois or fine sieve Let mixture mature for 24hours. Churn in ice cream maker according to manufacturers instructions. Rub together in a bowl until mixed and crumbly. Spread out on a lined baking sheet and bake in an 170 degrees C oven until golden brown. Cool completely and store in the fridge until ready to serve. Pulse nuts in a food processor until it forms a fine meal. Add icing sugar and pulse a few more times to combine. (Original recipe calls for you to process nuts and regular sugar in Thermomix) Sift nut mixture with plain flour. 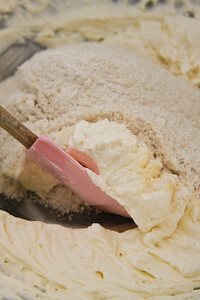 Using an electric mixture, whip cream to stiff peaks. 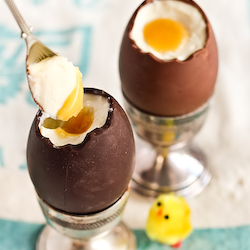 Also with an electric mixer, beat eggs whites to soft peaks then gradually add sugar and continue to beat until egg whites are very stiff, white and glossy. Working very quickly, fold dry mixture into whipped cream until nearly combined, then add egg whites and fold again. Pour mixture into a lined 20cm round springform tin with a removable base. 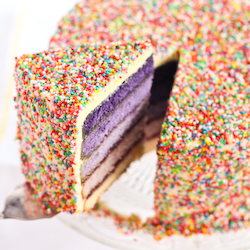 Bake at 180 degrees C for 25-30 minutes or until the cake is cooked through and golden on top. Avoid opening the oven while it is baking as this will make the cake collapse. With the 125g of sugar make a fairly dark caramel by heating the sugar on medium high heat in a medium saucepan. 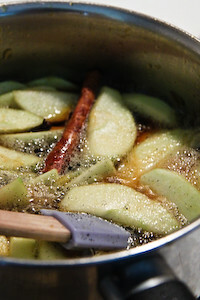 Then add all other ingredients, including the apples, bring it to the boil and set aside to infuse for a further 30 mins. Strain off all ingredients and poach chopped apples (on low–medium heat) till just soft. 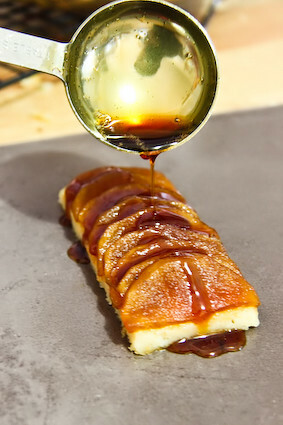 (I admit I was lazy and just continued to poach the apples in the caramel sauce and then strained them out when they were ready). one minute. 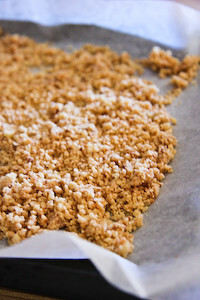 Heat the apples in a saucepan over medium heat until sauce reduces to a caramel (takes approximately 3-4 mins, I found my mixture a little too sour cos of the wine I used so I added more sugar) Add equal quantities of popping candy in a bowl with the crumble mix (one tablespoon each). Place the sponge on a plate, put apples & sauce on top, then crumble mix and ice cream on the side. Serve immediately. Thanks to George from Wasamedia & Chef Tomislav Martinovic for sharing this recipe. I thin k I'll keep 'em separated! i needs to get me some apples now. and uh poprocks. this looks like such an interesting recipe! The poprocks would be a whole new level of awesome to apple crumble. I love the sound of the clotted cream ice cream too. imagine swirling strawberry coulis through it. Yum! 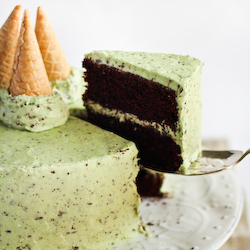 how can I resist to such a beautiful/delicious dessert! It's an amazing apple crumble!!! I'am addicted to crumbles and your recipe is pure indugence! Thanks for sharing the recipe with us Steph - am always on the look out for restaurant quality desserts that I can actually re-create at home! Hehe I'm loving pop rocks in everything! 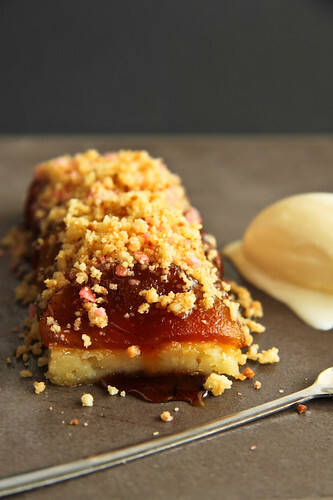 I love apple crumble and this dessert is giving me tingles. you are popping rock master - beautiful photos! Steph- you are so wrong! You are one of the best baker that I know. Everything you do/bake- you do so well. I'm so lucky to have the opportunity to taste some of your creations. This will be on my "To Try" list. Awesome shots Steph! Boo about the temperamental oven, but at least it still tasted yummy and it looks gorgeous. Nothing beats a dessert with a little bit of popping action! I love apple desserts, especially crumbles! You had done an awesome job and I bet it tastes just as good as Tomislav's (albeit a bit different)! Popping candy win! oh wow, this crumble looks amazing!! I want to eat my computer screen right now! Ahh, so _this_ is what you made the other day! I looked at the photo on twitter and had no idea but now I do, I'm loving it. Pop it up, baby! Lisa - Oooh clotted cream ice cream with strawberry swirls sounds amazing! Must try. Laetitia - Aww thanks so much. I'm addicted to crumbles too! Karen @ Citrus and Candy - LOL tingles. You make everything sound dirty! Phuoc'n Delicious - Heehee! Thanks :) We should start a petition! vuedecuisinier.com - :D Thank you! Brenda - Haha awww too bad. 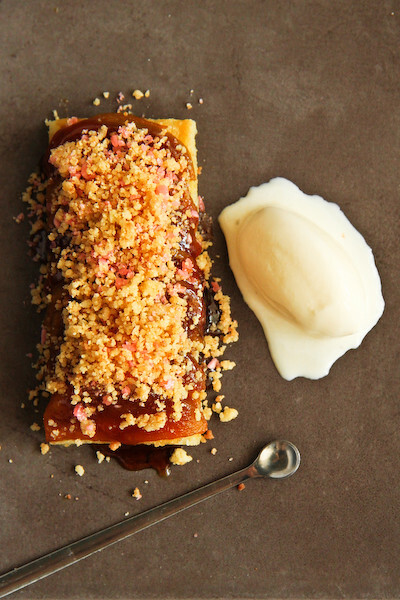 You could just make the crumble and have it with ice cream! FFichiban - Haha yes it is definitely different. Must go try the real thing to compare! Honey @ honeyandsoy - Haha it's actually a cake but it does look like a tart hey? Go try it! 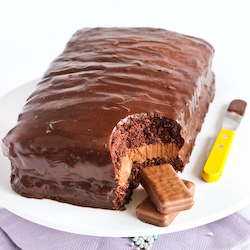 Bryt - Thanks so much :) It's a very cool recipe hey? Conor @ Hold the Beef - Haha yes! I don't think anyone could have guessed it unless they'd tried it at the restaurant first :) Thanks! I need to stop looking at these posts while hungry! That looks delicious. AB - Haha yeah that can be dangerous :) It was! Amelia PS - I know right? He's a very talented chef. Can't wait to try it in the restaurant!